Contact: B. Pappas for 10:30 a.m. The word “acolyte” is derived from the word “akolouthos,” which is the ancient Greek word for an attendant or helper. The most important duty of an acolyte is to be an attentive worshiper and leader during church services. 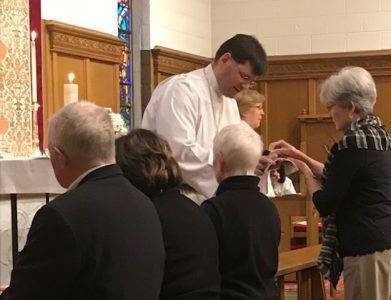 Acolytes are the “assistants” to the priests and deacons at the altar. They help the worship service flow along as smoothly as possible, and are called upon to act with dignity. 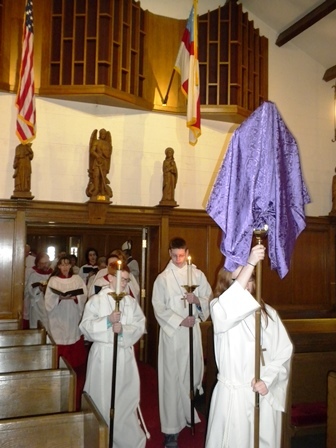 8:00 a.m. services: There are several acolytes serving on a regular schedule for the 8:00 a.m. services. Any of them are available to substitute for the scheduled acolyte on Sunday if necessary. If available, all are able to serve for special occasions. We are in need of a church member to serve on a regular basis or as a substitute at the 8:00 a.m. service. The Altar Guild is responsible for care and maintenance of items used in worship, and for preparation of the altar for services. This group generally works “behind the scenes,” but their efforts are essential to the smooth operation of the parish. Most Altar Guild members find that their work is not only practical, but also very spiritual. In doing this work, we learn about the traditions of our church and the significance of some of our rituals. If you are interested in assisting with our “holy housework” please speak to E. Backhurst. We would welcome women, men and young people from each of the Sunday congregations. The Choir sings the anthem. Rehearsals on Wednesdays at 7 p.m. and Sundays at 9:30 a.m.
Worship is at the center of life at St Michael’s. The Eucharist, lessons and sermons combined with music are the focus of our worship at St Michael’s Church. Our musical background is rooted in traditional Episcopal hymnody, as well as more modern gospel and spirituals, with the choir helping to lead hymns and liturgical music. The Adult Choir sings four-part music from the Renaissance to modern-day composers. 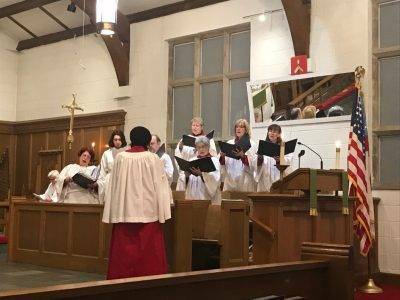 The Choir rehearses on Wednesday evenings at 7:00 p.m. and on Sunday mornings, from 9:30-10:15 a.m.
Eucharistic Minsters assist the clergy during the administration of the chalice at the Eucharist. These people complete a training session and are licensed by the Bishop. A schedule, based on individual availability, is made up periodically through the year. Those wishing to participate in this ministry should contact F. Twiddy. The Greeters meet folks as they enter the door for services. It is important to create a welcoming and friendly environment for our parishioners, as well as for those who may be visiting or are new to St. Michael’s. If you would like to be a greeter, please contact E. Garzel. Lectors are lay people who read the lessons, lead the Psalms and the Prayers of the People. A schedule, based on individual availability, is made up periodically through the year. This ministry is open to anyone. If you would like to be a lector, please see F. Twiddy. Ushers provide friendly assistance to worshipers before and during services. They distribute bulletins, help folks find seats, collect the offering and manage the “people flow” during Communion. If you are interested in being an usher at our 8:00 a.m. service, please contact G. Solomon; to assist at 10:30 services, please contact P. Dyble or B. Payton.